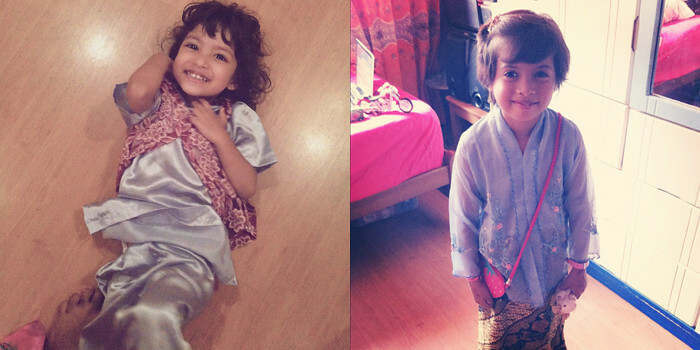 Two of my cousins' kids, Aishah, and Nora. While I welcome Ramadan with wide open arms, Eid is a different matter all together. Because my father is the eldest in the paternal side of the family, people tend to come to our home on the first day. Thankfully, over the years, due to multiple families in the paternal side of the family causing distress to mine, we have cut off all ties and I'm never acknowledging them as family. Such drama, I know. But without them in my family, I'm happy to say, I'm more welcoming of Eid than I was before. There will always be awkward forced small talk, but there will no longer be forced small talk with people whose guts I detest and whose faces I want to punch in. Instead, today was spent with people whose company I enjoy, kids who used up all my energy and without fail, stuffing my face with my mum's amazing food. Time for a run now. Since I visited them over two years ago in Belgium, my cousin Mush has become a confidante, and unfortunately, anything more than superficial relations in my extended paternal family is extremely rare. She and her husband are such wonderful people - well-read, well-travelled, and everything else that makes me proud that we share blood. Today, when we broke fast together, I watched my niece, their daughter, Nora, who's turning seven in a few months, conjure stories in Flemish with her little army stuffed animals and it was such a delight watching a child be a child and use her imagination instead of being glued to a gadget. She knew she wanted ravioli, polished off the whole plate and split a chocolate cake with her father. She also apparently, gave the restaurant her approval because the bathroom was spotless. I don't understand a word of Flemish, but the way she carried herself, the way she spoke to her parents, and the conversations she'd have that would get translated for my benefit made me realise that Nora is growing up to be quite the little lady and it made me feel all warm and fuzzy looking at their family. It reassured my faith in the world, especially after the week I've had. Now, I twiddle my thumbs for the time we can communicate in English instead of through sign language and tickles. For being the more laid-back of the two people who've raised me. For working day and night to make sure there's always good food on the table, there's always a roof over our head, and for making sure we never have to worry about money. For working so our mother doesn't have to. For teaching me how to appreciate food. For teaching me how to travel. For loving us, in your own incredibly simple way. For the knowledge that you'd be contented enough with good food in front of the telly. For teaching me to fear nothing, but God. Happy Father's Day, Abah. I love you heaps.